Mascots in Football are seen as a symbol of good fortune, as well as a way of representing a group with a common public identity. From the days of old of John Bull, mascots have come as ‘lucky charms’ ranging in form from live animals, to costumed characters. 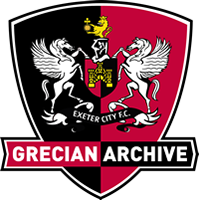 Exeter City is no different in this global trend, and Sid Thomas noted that as early as 1910, the club had a large English sheepdog called Laddie, in line with most other prominent football clubs in the football league. The 1930’s saw the arrival of one of the clubs most famous talismans in the form of a seagull. Swooping into the park, ‘Dido’ is said to have sat on the crossbar for Exeter’s run to the sixth round of the FA Cup, although sadly he did not make an appearance as City crashed out to Sunderland. 1931 was not the last involvement of Dido in City’s affairs. The FA Cup recommenced in 1945/46 when it was a two leg tournament, but in the following season the competition reverted to its original format and Exeter were drawn to meet Bournemouth away. On November 30th 1946 the City captain Harry Hanford (?) carried on to Dean Park a cage that imprisoned a seagull captured in Devon beforehand and transported with the team. He then set the Dido reincarnation free on the pitch. Unfortunately the luck flew away with the bird and we lost 4-2! Mascots come in many forms, and it is rumoured that in the championship-winning season of 1989, a horseshoe was nailed over the door of the home dressing room, as City proceeded to go 31 home matches without defeat! More recently, Exeter has seen the likes of Alexander the Greek and Grecian the Lion. But no one who saw it would forget the 'half-time turkey', dressed in opposition colours, that wandered the St. James’ pitch, only to be ‘shot’ with a blunderbuss! An Argyle fan complained of this prior to the Boxing Day clash between Exeter and Plymouth in 1992, and this particular bird was removed… Didn’t stop City winning the derby 2-0 though!